Stephen Moss wrote a 2013 article for The Guardian called The Grand National: sport or barbarity? In this article, Moss questions whether it is worth keeping alive the one hundred and seventy-five-year tradition of horse racing. Many of SCAN’s readers probably have negative views on horse racing and wish for it to be banned from the United Kingdom. I, however, take an opposing view. After working with racehorses for over five years and training around twenty or so phenomenal young horses, I have seen the benefits of horse racing that many don’t see. Many people against racing argue that the racehorses are forced to race and don’t enjoy it. I can tell you now that if a horse doesn’t want to do something, it won’t. I have had one horse (a thoroughbred named Lily, now Leeswood Lily) sit down on a trailer ramp and refuse to budge because she’s enjoyed herself at the beach so much. Horses are like humans: they all have their individual personalities, strengths and weaknesses. Any horse who does not excel at or enjoy racing, doesn’t enter a race. This is sometimes a difficult decision, but the majority of owners will accept this and ensure the horse has a pleasurable future in a different discipline of equestrianism. Another argument against banning horse racing is the question of what would happen to the current and future racehorses? Racehorses are a different specimen of horse: they are athletes and have the attitude of athletes which some people cannot handle. My boss once had a horse called Golden Call (Freddie) who was a nightmare to handle and lived to race. Freddie had a special winning attitude, he always wanted to win and once he was galloping, it felt like heaven to ride him. But Freddie would have been put down if he had been in any discipline other than racing because of his attitude and difficulties. 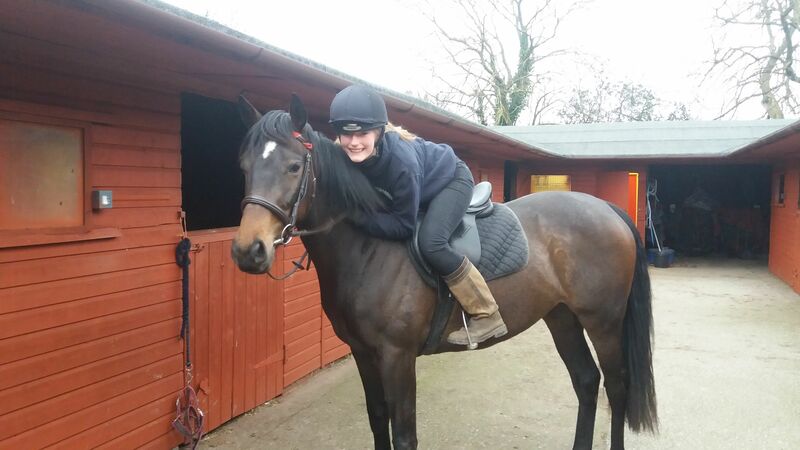 There are many horses like Freddie who have been given a chance and are understood because of the racing industry. Banning racing would end the lives of thousands of racehorses because they would have no homes and would be neglected. I know that horseracing has many negatives, but I hope I have put across the opinion of someone who has experience and knowledge to back up her argument. Many readers might think that I only feel positively towards horseracing because it gives me a pay check. But I would like to write that, as with every horse I’ve ever worked with, each racehorse I have worked with has a special place in my heart. I am lucky to work with my boss’ horses from birth, through their training, racing and retirement. Part of my job is to see that the retired racehorses go to loving homes and are retrained as riding horses properly, so they can enjoy their lives away from the track. Also, I’d like to point out how other disciplines of equestrianism do more damage to horses than racing. In dressage, some horses are left with permanent damage due to an uncaring rider, and in cross country events some horses experience rotation falls and never get back up. There is little public anger towards this, despite it being publicly broadcasted in events such as the Olympics and Badminton Horse Trials. I do feel like people jump on the bandwagon when it comes to criticising the horseracing world, without looking around and realising that abuse can happen in all horse disciplines. And most of these other disciplines are arguably worse than racing.